Hi Tech Carpet & Furniture Cleaning located in Columbus, NJ 08022 has been providing carpet cleaning services and furniture cleaning services serving Burlington County, NJ, Mercer County, NJ and Monmouth County, NJ since 1990. Hi Tech Carpet & Furniture Cleaning is a Von Schrader Authorized Associate and exclusively uses Von Schrader dry foam/low moisture soil extraction carpet cleaning machines for all of its carpet cleaning jobs. Contact us today to schedule a carpet cleaning or furniture cleaning appointment. Why Dry Foam/Low Moisture Soil Extraction? There is a difference in cleaning methods. Dry foam/low moisture soil extraction cleans better and is faster drying. Von Schrader dry foam/low moisture soil extraction is an exclusive, patented system that vacuums away dirt-laden foam simultaneously  the instant emulsified dirt is separated from fibers. 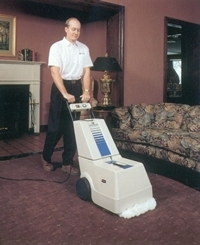 Click here to see how the dry foam/low moisture soil extraction carpet cleaning system works. Carpet cleaned by the dry foam/low moisture soil extraction system is noticeably and beautifully brighter, softer, cleaner, drier  right after cleaning  and it stays that way longer! No sloshy puddles or bad smells; it can't shrink, warp or mildew as with steam cleaning (because not enough moisture is involved to cause these problems). The carpet cleaning and furniture cleaning products used are environmentally safe. Carpet dries fast  often in less than an hour. Click here to see how the dry foam/low moisture soil extraction carpet cleaning system is superior to steam cleaning. For fast-drying carpet cleaning and fast-drying furniture cleaning, there is only one choice, Hi Tech Carpet & Furniture Cleaning of Colmbus, NJ 08022! Below you can see examples of before photos and photos of carpet cleaning and furniture cleaning after using our services. Our carpet cleaning and furniture cleaning processes uses gentle, biodegradable, non-toxic, and fragrance-free cleaning agents that leave no sticky or oily residue to attract and hold soil. Certified technicians offer odor control, carpet stain resist treatments, spot removal...a complete life extending line of services to prolong the use and beauty of your carpet and upholstery. Carpet Stretching for Loose & Wavy Carpets. Scotch Guarding of Carpets and Furniture. White, Beige and Leather furniture cleaning. Pressure Washing of Homes, Decks, Fences, Sidewalks, Patios & Driveways. Copyright ©2010-2017 Hi Tech Carpet & Furniture Cleaning, Columbus, NJ 08022, All Rights Reserved. Web Design & Webmaster Services by: Cybervision Web. Company Logo Design by: James Reilly.